Steven Gerrard has always been honest to a fault and even on Liverpool’s own club media he could not help but come clean about the reasons behind his seismic departure from Anfield. In an emotional interview, the 34-year-old admitted his fear at the prospect of becoming just a bit-part performer at the club where he is held up alongside Kenny Dalglish as the club’s greatest ever player was too devastating to contemplate. Hence the contract offer he was offered by the club in late October has remained unsigned and he will head to the United States in the summer for a new life. ‘I think the key conversation or moment was with the manager when he sat me down not so long ago and said it was time to manage my games for me and for the team,’ said Gerrard, as he explained the decision that has caused shockwaves on Merseyside and beyond. ‘I’m bright enough to realise it is the right thing for everyone, but when you’ve been a starter and a mainstay in the team for such a long time, it was a very difficult conversation to have. ‘I accept it and I’ll continue to give everything I’ve got, whether I’m starting, coming off the bench or whatever, but that was the key conversation that swung me to deciding to come away for a short while. Gerrard was deeply hurt by being left out of Liverpool’s Champions League tie against Real Madrid earlier this season even though he knew manager Brendan Rodgers was only managing in the way he felt fit. He has subsequently been left out of some Premier League matches. The midfielder retired from international football after last summer’s World Cup to prolong his club career but even without international football Rodgers felt his legs and physical recovery were insufficient for him to play in every Liverpool game. And that would only have increased next season. The relationship between iconic captain and young manager has been under the spotlight all season. A piece by Gerrard’s friend Jamie Carragher suggesting Liverpool had not done enough to keep their leader only added fuel to the fire. In his own way, Gerrard tried to assure his fans that he can see Rodgers has acted with a professional hat, and that he didn’t feel his treatment has been anything personal. ‘I had an idea it was going to come at some time — I’m a human, not a robot. I’m not 24,’ he said. ‘I wish I was 24, I wish I’d met Brendan when I was 24 because I think I’d be sitting here talking about a lot of titles that we’d won together. The reality is, Brendan came into this club when I was 32 and it’s a shame that relationship didn’t start 10 years ago. 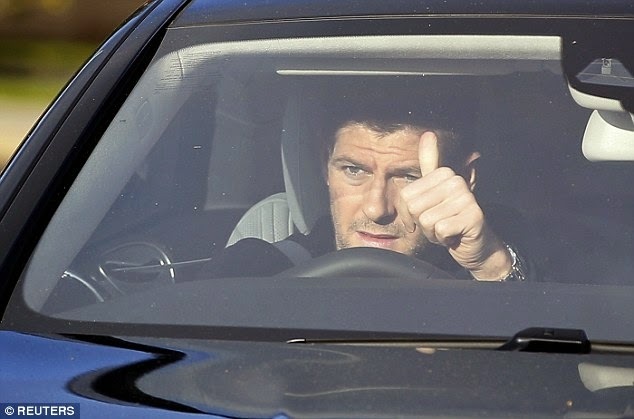 Rodgers confirmed there had been no offer of a coaching position to Gerrard in negotiations because he got the impression from the player that he wanted to continue being regarded purely as a player. ‘It wasn’t part of the conversations because Steven hasn’t got his badges, and he isn’t the type who will just go into coaching blind. ‘He is very thoughtful. His focus was very much in the present — which means playing because he still believes he can play beyond this season. Liverpool has been like a city in mourning since Gerrard’s announcement. Los Angeles Galaxy looks his likeliest destination but for now the player admits his biggest challenge is keeping his own emotions in check so he can help Liverpool in the remaining months of the season. They are still in the Europa League, which may be their best route of qualifying for next season’s Champions League, and begin their FA Cup campaign at League Two AFC Wimbledon on Sunday night. ‘It’s been an emotional 24 hours for myself and my family, but there are still six months to go and I’ve still got plenty to try and achieve, so I am trying to keep my focus on that. There’ll be plenty of time for tears and sentiment come the end of the season,’ he insisted. Going to California with wife Alex and their three daughters doesn’t sound like a punishment but breaking the news that they would soon be leaving the only home they’ve known was not easy. Rodgers has a way with words that doesn’t always encourage sympathy. But the Ulsterman has been in an unenviable position over Gerrard.Such is the player’s legend — Huyton boy who singlehandedly won the Champions League and turned down Chelsea the same summer — Rodgers knows every time he left Gerrard out, it would create questions. And yet if he wants to deliver a new high-tempo Liverpool based around the likes of Raheem Sterling and Daniel Sturridge, a break from Gerrard might suit him too. ‘I have not been party to whatever has gone on with the club and his agents, but we wanted to keep him at the club. 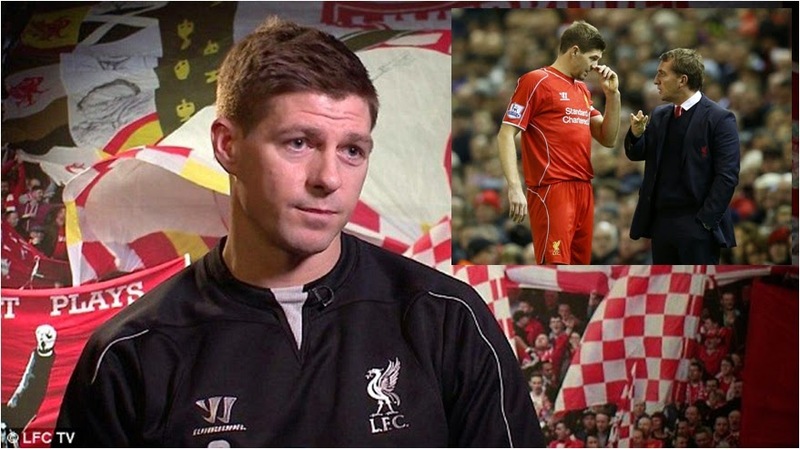 I still wanted Steven to be a part of what I was doing at the club,’ he said on Saturday. The popular outcome would be for Gerrard to enjoy the sunshine of Los Angeles for a couple of years, return to Anfield as a coach under Rodgers and one day become the manager of Liverpool himself. Yet both men know fairytales don’t always come true. ‘I don’t see any reason why Steven couldn’t be a top manager,’ said Rodgers. ‘In my time here, he’s been a wonderful leader. If he puts that commitment into wanting to do it, like he’s shown in his football career, there’s no question why that couldn’t happen. For now, Gerrard has professed to have been overcome by the tributes and messages from team-mates, supporters and people in his city. ‘I didn’t realise it would be as big as this,’ he says. He has personally promised Rodgers there will be ‘no downing of tools’ between now and May. This year’s FA Cup final will be on Gerrard’s 35th birthday — what a way that would be to go out. 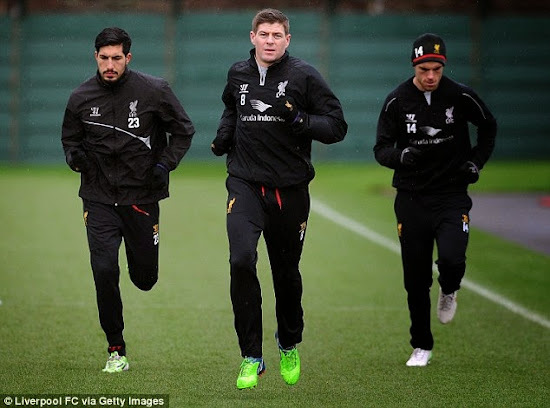 The professional paths of Rodgers and Gerrard are going to diverge in six months’ time. But if it’s to be called divorce, at least it is an amicable one.